Justice Raymond Zondo presiding over the Commission of Inquiry into State Capture says urgent steps must be taken against those who have not responded to summons requesting them to give evidence to the commission. Evidence leader, Advocate Leah Gcabashe has told the commission that the statement of former finance minister Trevor Manuel implicates ANC NEC Member Fikile Mbalula, Atul Gupta and Ajay Gupta. She says she has noted that Atul Gupta has not responded to the notice while Ajay has responded and Mbalula was served his notice by email but has not acknowledged receipt or responded. 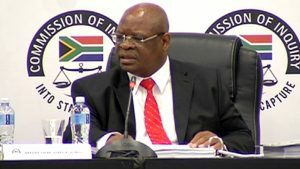 Deputy chief Justice Raymond Zondo says the commission won’t tolerate any further delays by those who don’t abide by the rules of the commission. He says those implicated by the evidence of former minister of Finance Trevor Manuel will have to come and testify as well. Meanwhile, Manuel has began giving testimony at the Zondo Commission of Inquiry into State Capture in Johannesburg. The post “Urgent steps needed against those ignoring summons to state capture commission” appeared first on SABC News – Breaking news, special reports, world, business, sport coverage of all South African current events. Africa's news leader..